The cheapest return flights from Geneva to famous Mauritius from €273! SkyTeam carrier Air France is offering an interesting offer to further discount your next flight from main airports in Germany to Mahé, Seychelles. Return flights are now available already for €493 when booking directly with this carrier. (Min. net fare has to be €180). This discount code works only in Economy class. Fare is including all taxes and fees and 23kg bag. Official conditions of this Air France promotion says there is limited amount of promo codes but have not managed to find how many they do giving away..You can use this discount code no matter the flight is operated by Air France, Joon or HOP!. (Otherwise this voucher does not apply to any codeshare flights). You can use this Air France promo code till 14th of February 2018. Travel period from 5th of May till 31st of December 2018. Latest date of your inbound flight is 31st of January 2019. How to book. : You can book this deal only at Air France DE. You need to enter promo code in separate box “Discount code / discount voucher” which you will find right below your personal details in step “Personal Information”. Once you fill in all mandatory details hit “Apply discount” at the bottom of page and price of your flight will be automatically discounted in next step by €50. 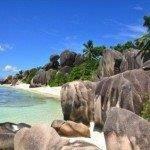 Booking sample of applied Air France promo code: Fly from Germany to Seychelles from €493! Your outbound flight from Hamburg to Mahé, Seychelles will be on 3rd of September. Your return flight from this exotic holiday destination in Africa back to Europe is on 20th of September 2018. Regular price on this oute is currently €543 but using currently valid Air France promo code 2018 you can discount your flight by €50.